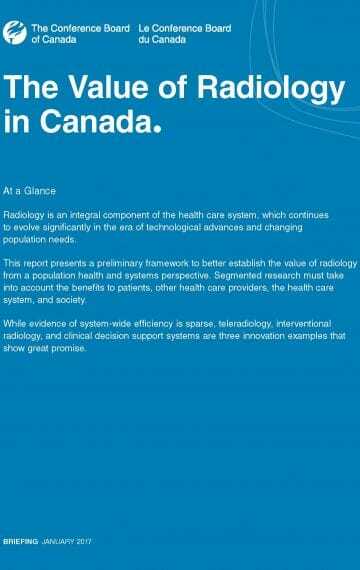 The Value of Radiology in Canada, a report by The Conference Board of Canada’s Canadian Alliance for Sustainable Health Care examines how radiologists and medical imaging have added value to the healthcare system, improved patient care, and driven cost savings. The report was produced in collaboration with the Canadian Association of Radiologists, including the pan-Canadian Value of Radiology group led by CAR representatives from all provinces. Health Accord – With the new health accord on the horizon, having clear messaging about the role of radiologists and medical imaging in the health care system helps the CAR and its provincial partners to position their advocacy work in a framework that emphasizes value rather than cost. Patient, practitioner and public messaging – The report can be used to start dialogues with patients, our medical colleagues, and the public. Valuation model – The Conference Board laid out a model at the end of the report that can inform additional work on the subject, and strengthen the position of radiologists and provincial radiology associations. The CAR will continue to pursue projects related to the Value of Radiology. This report will serve as a springboard to further inquiry and research which highlights the quantitative and qualitative value of radiologists and medical imaging to the healthcare system on a national and regional basis. We encourage all members and other interested parties to read the report* and to consider how they can contribute evidence and information to future work on the value of radiology. *The Conference Board of Canada’s website will prompt you to create an account or sign-in to read the full report. Access to the report is free.